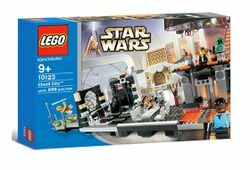 10123 Cloud City is a Star Wars set released in 2003. This set was first released at the price of $99.99 in LEGO Shop At Home catalogs. The set's features include a "working" carbon freezing chamber that lets you lower Han Solo downward and the carbonite back up replacing Han Solo, a sliding door, a window that catapults Luke Skywalker, and a Twin-Pod Cloud Car landing pad with many lime green studs for lights it. It was most notable for being the first appearance of a Lando Calrissian Minifigure. This set is also the only one released so far that has Lando in his most recognized clothing (the other being on 6210 Jabba's Sail Barge where he is in disguise). It also contains an exclusive Boba Fett Minifigure with normal printing, but also with armour plating on his arms, legs and on the belt. This set is for ages 9+ and contains 698 pieces. It was actually issued as a UCS. This set saw the return of Padmé Naberrie's hairpiece, used for Princess Leia. This is the only set that features Boba Fett with extra printings. Han Solo is wearing the Episode IV outfit instead of the Episode V outfit, which is a blue coat. Lando Calrissian is shown armed with a blue tipped blaster gun instead of red. Lando has a unique cape which is yellow on one side and light blue on the other. This set saw the only appearances of Luke Skywalker (Bespin), Princess Leia (Bespin), Boba Fett (extra printings), and Lando Calrissian (Bespin). According to the UCS Promotional Poster, this set was retired in 2005 and includes 705 pieces, not 698. Even though the landing platform was specifically designed for the Cloud Car, the Slave I released at the time perfectly fits on the platform. This is a description taken from LEGO.com. Please do not modify it. (visit this item's product page) Return to Cloud City™! Han Solo™ and Princess Leia™ have journeyed to Cloud City™, only to discover it is an Imperial trap! Now Luke Skywalker™ must challenge Darth Vader™ to try and save his friends! More than 25" in length! Full Action Play: Blast Luke through the window! Drop Han into the carbonite! Based on one of the most famous locations from the original Star Wars™ trilogy, this set is the perfect addition to your Star Wars collection! Recreate your favorite moments from Star Wars™: Episode V The Empire Strikes Back, or create your own thrilling adventures! Facts about "10123 Cloud City"
This page was last edited on 17 August 2017, at 02:44.